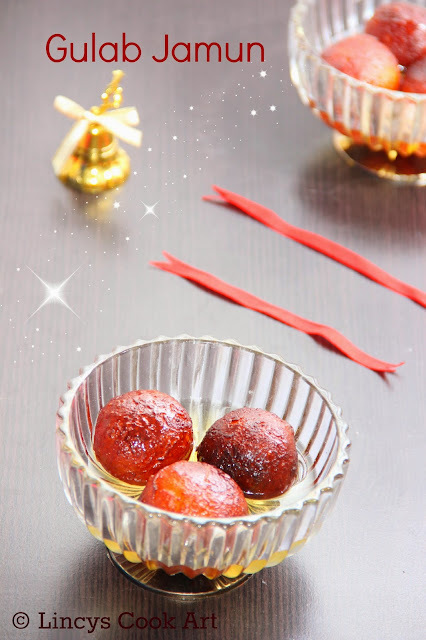 'Gulab jamun' is a milk-solid based dessert, similar to a dumpling. It is made mainly from milk solids, traditionally from freshly curdled milk. In India, milk solids are prepared by heating milk over a low flame for a long time until most of the water content has evaporated. 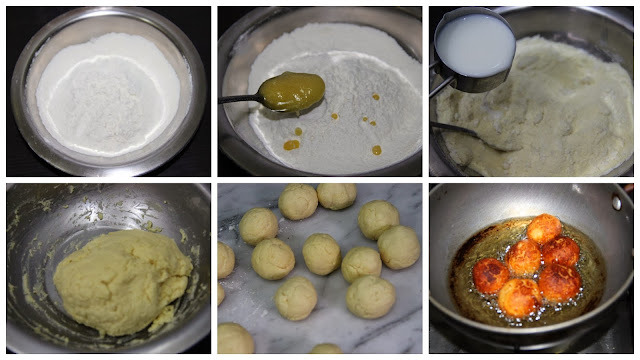 These milks solids, known as ‘Khoya’ in India, are kneaded into a dough, sometimes with a pinch of flour, and then shaped into small balls and deep fried at a low temperature. The balls are then soaked in light sugar syrup flavored with green cardamom and rosewater or saffron. I have used here dry milk powder which we use for preparing tea for making the jamun. But you can replace this with Khoya/ Kova. Mix Khoya with all purpose flour and baking soda and deep fry. 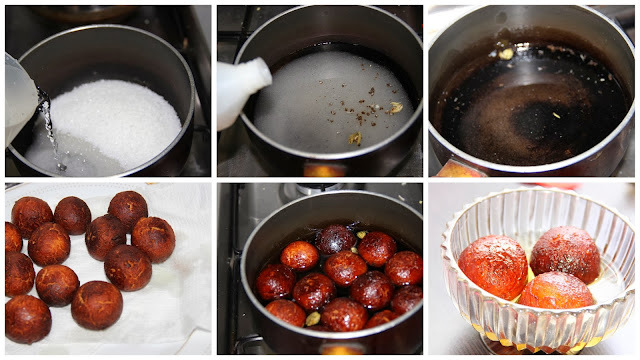 Don’t add milk to make jamun balls. Khoya can be freshly prepared by boiling milk for some time and when it reaches thick creamy consistency add a drop of lime juice or yoghurt which curdles the milk. Then separate the milk solids from water using a sieve/ colladar. Sieve Milk powder, all purpose flour and baking soda into a bowl, it helps to baking soda mix evenly and avoid lumps. Add ghee and slowly add milk to form soft dough. Keep it aside for about 5-10 mints. It will helps to absorb excess milk and makes softer balls. With a drop of ghee grease your palm (optional) and make gooseberry size balls out of the dough. Meanwhile heat oil in a pan on medium flame for frying. Once the oil get heated reduce the flame to low, carefully drop the balls into oil and deep fry until it turns golden (Do not increase the flame), to get an even color keep rolling the balls with spatula. Once the balls are ready, take out into a paper towel and drop the hot balls immediately into the warm syrup. In a pan add sugar, water, rose essence and crushed cardamom pods. Once it starts boiling, reduce the flame and allow it to simmer. Stir well the syrup until the sugar dissolved completely. Check the syrup for sweetness and consistency should be thin syrup. Not thick and grainy. Keep it aside. If the dough is too dry and not combined, add little more milk to make balls. Don’t make the oil too hot ,it will become hard inside and burnt outside. So always keep in low to medium flame. If you add more baking soda, it will change to soapy taste, too soft and also cracks while frying. The Jamun expands the size while frying, so make sure the pan has enough space to accommodate the Jamuns. The Jamun will be hard if knead or if you press the dough too much. Allow to soak the balls in the syrup for at least 30-45 mints. Preferably allow to soak overnight for more softer jamuns. Wow, it looks super soft and delicious. Gulab jamun looks really soft and yummy...my favourite.